The Chicago Cubs caught a bad break in terms of travel this week. After Wednesday’s home loss to the Milwaukee Brewers, they had to jump on a plane and fly to Washington, D.C. to play a make-up game against the Nationals that had been rained out last weekend. That game ended at almost 8:00 p.m. local time, at which point the Cubs had to jump right back onto another plane and fly home, where they will play the Reds tonight at 7:05 p.m.
That’s the sort of short-term travel schedule that tends to make athletes very grumpy—the Cubs didn’t check into their hotel before yesterday’s game until 4:00 a.m.—and this one is particularly rough because it comes in a 30-day stretch in which the Cubs will not have a single day off. 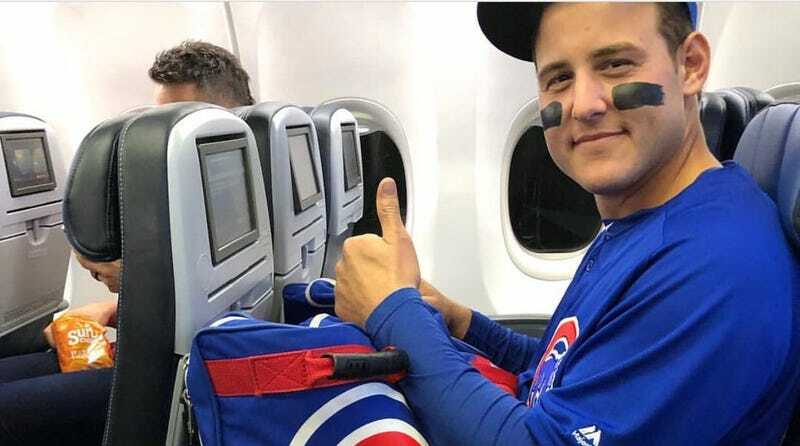 First baseman Anthony Rizzo took the hectic schedule in stride, though, opting to just wear his uniform on the flight from Chicago to D.C.
Rizzo arrived at the Nationals’ park in full uniform, and told reporters before the game that he didn’t even pack a change of clothes for the quick trip to D.C. This is all fun and good, but pity whoever had to sit next to Rizzo on the flight back to Chicago.